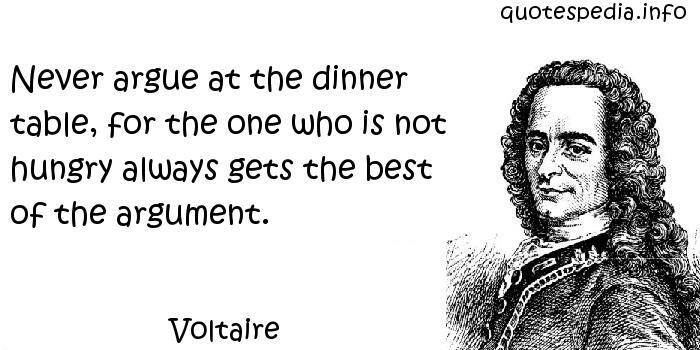 Never argue at the dinner table, for the one who is not hungry always gets the best of the argument. A noble person attracts noble people, and knows how to hold on to them. War has always been the grand sagacity of every spirit which has grown too inward and too profound; its curative power lies even in the wounds one receives. People don't mind being mean; but they never want to be ridiculous. It's a kind of spiritual snobbery that makes people think they can be happy without money. This City is what it is because our citizens are what they are. A gentleman is one who never hurts anyone's feelings unintentionally. Intolerance is itself a form of violence and an obstacle to the growth of a true democratic spirit. Do you wish people to think well of you? Don't speak well of yourself.